Our Tangier cruise port guide gives you information about the docking location, cruise dock, transportation options and much more! 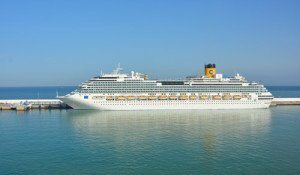 Welcome to the Tangier cruise port guide. 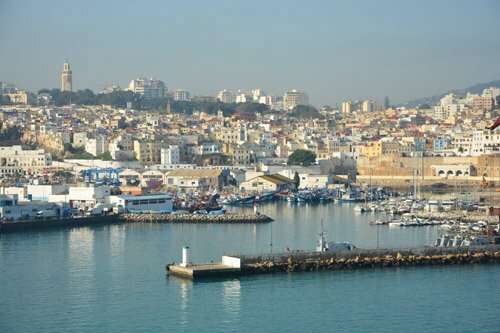 With 1,8 million inhabitants Tangier is a mayor city in northern Morocco. But this town is not entirely Moroccan. As soon as you travel north of Rabat you will notice there is a strong Spanish influence here. This is not that weird if you think that it is 60 km from Gibraltar and 14 km from Spain. This is the reason why you find an incredible mix of Moroccan, European and African all in this town of Tangier. After Casablanca they are also the most important industrial centre of Morocco. Things are changing fast here. The industry is diverse and focusses on textile, chemical, mechanical and naval. The city is currently undergoing a rapid development. The city is upgrades and modernised. Over the next few years you will notice that the city will get cleaner, the new cruise terminal is being build and the boulevard is being upgraded. This is the docking location for cruise ships in Tangier. There is a long pier that goes to the ferry terminal. When you exit the terminal you see a huge wall in front of you. This is the wall of the ancient medina. Find the entrance to the left hand side. Expect that there are lots of people on the dock trying to sell you something, whether it is a nice souvenir, a scarf or a taxi tour. The cruise ships dock at the port of Tangier. This dock are about 1,5 km away from the old Medina or city centre. This is about 20 minute walk from the ship. Most often the ships do not provide a shuttle service into town, but check this information with the front office on board. The facilities on the dock are limited. There is no tourist information, no maps, no hop on hop off bus and no wi-fi at the port. There are limited forms of transportation to find in Tangier. Expect that taxis will be plentiful but local transportation is limited. Walking to town is easy and the only way to explore the Medina is by foot. However, if you want to go further afield, we recommend a organised tour or perhaps a taxi tour. Taxis are available at about a ship length walk. Expect that a ride to the city will cost you about 5 euro. Taxi tours run for about 10 euro per hour. Taxis will take Dirham (local currency), Euro and US dollars. – Is Tangier safe? Yes it is. Remember that if it wasn’t safe, your cruise line wouldn’t go there, just use your common sense. – Do taxi’s take US dollars and Euro? Yes, in general they do. 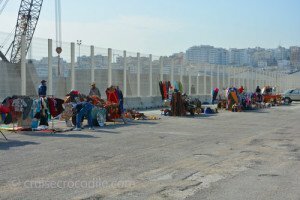 – Do the shops at the Medina take US dollars and Euro? Yes, they do. The heart and soul of the city. It separates the new from the old town. You’ll find that there are a lot of things happening on this square. It is a great square for people watching. Visit the city gardens Jardins de la Mendoubia north of the Grand Socco Square. Famous for its 800 year dragon tree and large marble fountain. In Morocco when talking about the Medina you are talking about the old town. In this case the Medina dates back from the 14th century that is still in very good condition. This is without doubt the most fascinating part of the city. It is overflowing with food stalls and vendors. They sell anything from spices, textiles, flowers to souvenirs. The Medina is quite big and it is easy to get lost in for the fact that it is one gigantic maze. Lots of locals are willing to tour you around the Medina. Feel free to say no. The tangier cruise dock is located at the port of Tangier, near the ferry docks. From here it is an easy walk to the city center. 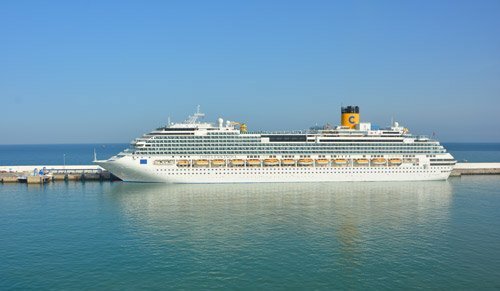 Read our full Tangier cruise port guide for all the information about its location and transportation options. Grand taxis: In Tangier you have two different type of taxis. The grand and the petit taxi. The grand taxi you will recognise because they are usually beige Mercedes sedans. These are the taxis that can take you for a tour around the area. Make sure to negotiate before you step in. Petit taxis: The smaller (and cheaper) taxis you will recognise by the blue color like you see on this picture. Keep in mind these taxis are not allowed to leave the city. When you want to take a ride within the city this taxi is perfect, but when you want to take a tour to get to other cities you will need to take a grand taxi. Petit Socco or “Little square” is in the middle of the Medina. It was one one of the greatest souks in all of Morocco. People would come here from miles around to buy food an clothes. In the 19th century the area grew wealthier and in the beginning of the 20th century many prominent men would come here to catch up on their gossip. Ville Nouveau is the part of town that nowadays own that position, but Petit Socco is still a nice square to hang around for a cup of tea or coffee and to befriend a stranger or two. Step in to get a feel for the local fish specialties and local business. We can’t guarantee anything about the smell, but it for sure is a local experience. The Kasbah is the old fortress and citadel that needed to protect the Medina. It is build on the highest point in Tangier. From here you can excellent views over the coast line. The history behind this building is also fascinating. The road to the Kasbah: When you are exploring the Medina you will come across the most scenic and unusual streets. It is quite hard to find your way up the Kasbah, but when you see this gate you know you are walking in the right direction. Always remember: The Kasbah is up, the port is down. From the Kasbah (the highest point of the Medina) you will also find beautiful panoramic views over the coastline. You can also see your ship in port from here. When you leave the port you can see the Medina right in front of you. If you dock at the normal spot you take a left to find the entrance to the Medina from where you can also take this picture. At the entrance of the Medina you will find information signs like this. Why not spend a moment or 2 looking at it to decipher the Medina. Remember: up is the the Kasbak, down is the the exit. Next to the Kasbah at the highest point of the Medina you will find this beautiful museum. You will find a collection of art form all over Morocco here. It displays carpets, silks from Fez, manuscripts and much more. The former kitchen is occupied by the Museum of Antiquities where you will find a Carthaginian tomb, finding from ancient Roman sites and much more.